Dr. C. L. Max Nikias is currently a Professor of Electrical Engineering and Classics at the University of Southern California (USC), the holder of the Malcolm R. Currie Chair in Technology and the Humanities, President Emeritus and a Life Trustee of USC. He has been at USC since 1991, and in addition to his work as a professor, has served as founding director of the Integrated Media Systems Center, an NSF Engineering Research Center (1995-2001), dean of the Viterbi School of Engineering (2001-2005), provost and executive vice president (2005-2010), and president (2010-2018). During his tenure as president, USC emerged as a global research university with an undisputed academically-elite status, due to a number of strategic initiatives that included: recruiting a cadre of transformative, world-class faculty and accelerating the expansion of the university’s academic medical enterprise; broadening USC’s international presence; dramatically improving the breadth, diversity, and quality of the university’s outstanding student body; improving the university’s infrastructure, including the development of the USC Village; and successfully bringing to closure the largest fundraising campaign in the history of higher education. Dr. Nikias is recognized internationally for his pioneering research on digital signal processing, digital media systems, and biomedicine. The U.S. Department of Defense has adopted a number of his innovations and patents in sonar, radar, and communication systems. He has authored more than 275 journal articles and conference papers, three textbooks, and eight patents, and has mentored more than 30 Ph.D. and postdoctoral scholars. Three of his publications received prestigious best papers awards. Dr. Nikias writes and speaks frequently about a range of nationally significant topics, including the value of—and access to—higher education; the current state and future of online education; the continued importance of the arts and humanities; the art of leadership through the classics; and the role of elite research universities, particularly as economic drivers. Dr. Nikias is a member of the National Academy of Engineering, a fellow of the American Academy of Arts and Sciences, a charter fellow of the National Academy of Inventors (NAI), an associate member of the Academy of Athens, a foreign member of the Russian Academy of Sciences, a life fellow of the Institute of Electrical and Electronics Engineers (IEEE), and a fellow of the American Association for the Advancement of Science. Among numerous other honors, he has received the IEEE Simon Ramo Medal, an Academic Leadership Award from Carnegie Corporation of New York, the Ellis Island Medal of Honor, the Woodrow Wilson Award for Public Service, UNICEF’s Spirit of Compassion Award, the State University of New York at Buffalo’s Distinguished Alumni Award, and honorary doctorates from his alma mater, the National Technical University of Athens; Hebrew Union College – Jewish Institute of Religion; University of Cyprus; University of Crete; University of Piraeus; and University of Strathclyde. As president of USC, Dr. Nikias led a $6 billion fundraising campaign, which—at the time of its launch—was the largest in the history of higher education. In six and a half years, USC’s campaign surpassed the $6 billion mark—18 months ahead of schedule—bringing to the university, on the average, $900 million per year. The fundraising campaign raised a total of $7 billion in eight years. During Dr. Nikias’ tenure, USC consistently ranked among the top five universities, along with Stanford and Harvard, in cash charitable donations. During Dr. Nikias’ tenure as president, the university advanced a major capital construction program that included Wallis Annenberg Hall, Dauterive Hall, Fertitta Hall, Michelson Hall, the Kaufman International Dance Center, the McKay Center, Uytengsu Aquatics Center, the Engemann Student Health Center, a new Cinematic Arts building, and the University Club at Stoops Hall, as well as the Soto Building, Currie Residential Hall, and Norris Consultation Center on the Health Sciences Campus, and beautification projects for both of USC’s campuses. The most prominent project, though, was the USC Village, a 1.3 million square-foot center of eight student residential colleges, that opened in 2017 and increased the University Park Campus’ footprint by a third, entirely reimagining the university’s landscape. In recognition of his efforts to renew USC’s athletics heritage, The New York Times selected Dr. Nikias as one of a small number of national figures “who make sports’ little corner of the world a better place.” He also served as chair of the College Football Playoff (CFP) Board of Managers (2015-18). From June 2005 to August 2010, Dr. Nikias served as USC’s provost and executive vice president, during which time he was charged with accelerating the academic momentum that USC had experienced in recent years. He was instrumental in bringing USC trustee Steven Spielberg’s Shoah Foundation Institute and its vast video archive of 55,000 testimonies of Holocaust survivors to USC. Dr. Nikias also established the university’s Edward R. Roybal Institute on Aging, Stevens Center for Innovation, U.S.-China Institute, and Levan Institute for Humanities and Ethics. He launched Visions and Voices, USC’s acclaimed campus-wide arts and humanities initiative, as well as a grant program to advance scholarship in the humanities and social sciences. Dr. Nikias spearheaded the integration of the Keck School of Medicine of USC’s faculty practice plans, and oversaw the transfer of University Hospital and USC Norris Cancer Hospital from Tenet Healthcare Corporation to the university. From 2001 to 2005, Dr. Nikias served as dean of the USC Viterbi School of Engineering, solidifying its position as a top-tier engineering school. He directed the expansion of the school’s biomedical engineering enterprise and developed its distance-learning program into one of the largest in the country at that time. He oversaw the development of the school’s cutting-edge Tutor Hall of Engineering. He also established key partnerships with corporations, among them Pratt & Whitney, Airbus, Boeing, Chevron, and Northrop Grumman, and led an unprecedented fundraising campaign that brought in more than $250 million, capped by a historic $52 million school-naming gift from Andrew and Erna Viterbi. Dr. Nikias graduated with honors from Famagusta Gymnasium, a school that emphasized sciences, history, and Greco-Roman classics. He received a diploma from the National Technical University of Athens, also known as National Metsovion Polytechnic, the oldest and most prestigious higher education institution of Greece, and later earned his M.S. and Ph.D. from the State University of New York at Buffalo. 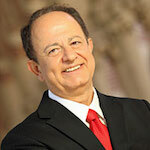 Dr. Nikias was awarded the Aristeia medal, the Republic of Cyprus’ highest honor in the letters, arts, and sciences. In addition, he received the USC Black Alumni Association’s Thomas Kilgore Service Award, the Los Angeles Police Department’s Jack Webb Award, and earned a commendation for cutting-edge research from the governor of California. His wife, Niki C. Nikias, received a bachelor’s degree in accounting from the Athens University of Economics and Business in Greece and a master’s degree in business administration with a specialization in finance from the State University of New York at Buffalo. She worked as a corporate accountant in Athens and London, and as an accountant and finance consultant in the United States before taking leave to raise their two daughters, Georgiana and Maria. The USC Alumni Association named Dr. and Mrs. Nikias honorary alumni of USC. The family has kept a home in the Palos Verdes Peninsula since 1991. Georgiana graduated from the USC Dornsife College of Letters, Arts and Sciences with a double major in English and archaeology and later earned a master’s degree in world archaeology from Oxford University and a J.D. degree from the USC Gould School of Law. She was inducted into the California Bar in 2012. Maria earned her B.A. degree in broadcast journalism at the USC Annenberg School for Communication and Journalism with a minor in entrepreneurship. After working as an associate producer for three years at ABC News’ national bureau, she earned an MBA at the USC Marshall School of Business.